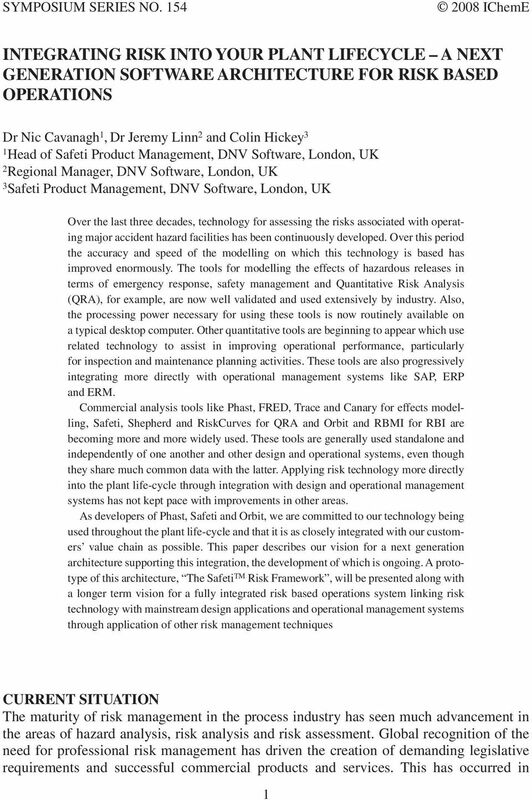 Download "Integrating Risk into your Plant Lifecycle A next generation software architecture for risk based"
6 In scenario 1 the foowing are a seection of potentiay undesirabe events arising from faiure of interaction between the controing and monitoring business processes on the site: 1. The paper based permit to work document indicating that the pump was unsuitabe for operation had been ogged incorrecty giving the impression that the pump was fit for service. 2. 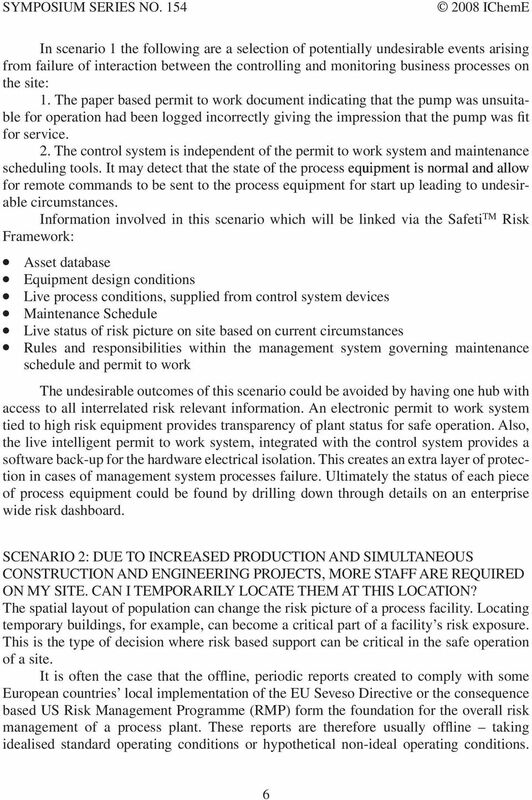 The contro system is independent of the permit to work system and maintenance scheduing toos. 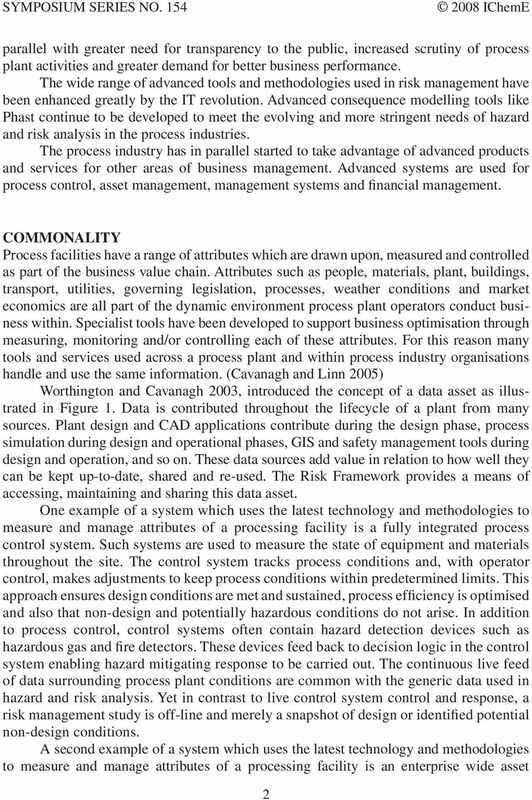 It may detect that the state of the process equipment is norma and aow for remote commands to be sent to the process equipment for start up eading to undesirabe circumstances. 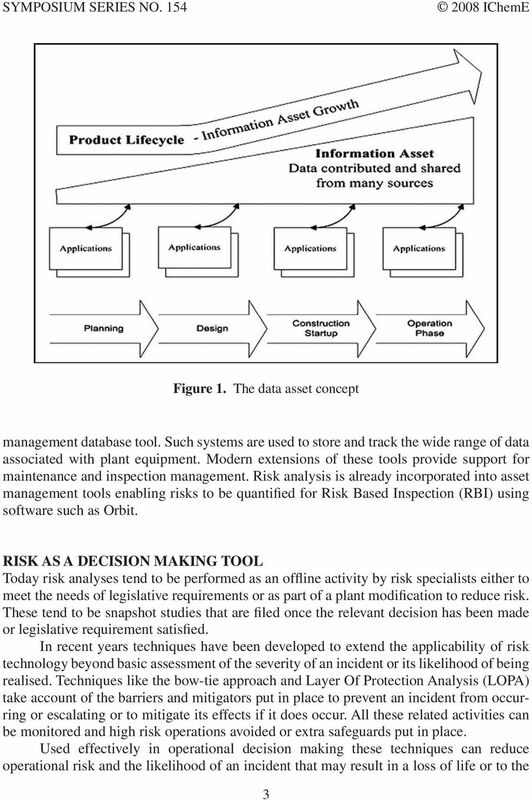 Information invoved in this scenario which wi be inked via the Safeti TM Risk Framework: Asset database Equipment design conditions Live process conditions, suppied from contro system devices Maintenance Schedue Live status of risk picture on site based on current circumstances Rues and responsibiities within the management system governing maintenance schedue and permit to work The undesirabe outcomes of this scenario coud be avoided by having one hub with access to a interreated risk reevant information. An eectronic permit to work system tied to high risk equipment provides transparency of pant status for safe operation. Aso, the ive inteigent permit to work system, integrated with the contro system provides a software back-up for the hardware eectrica isoation. 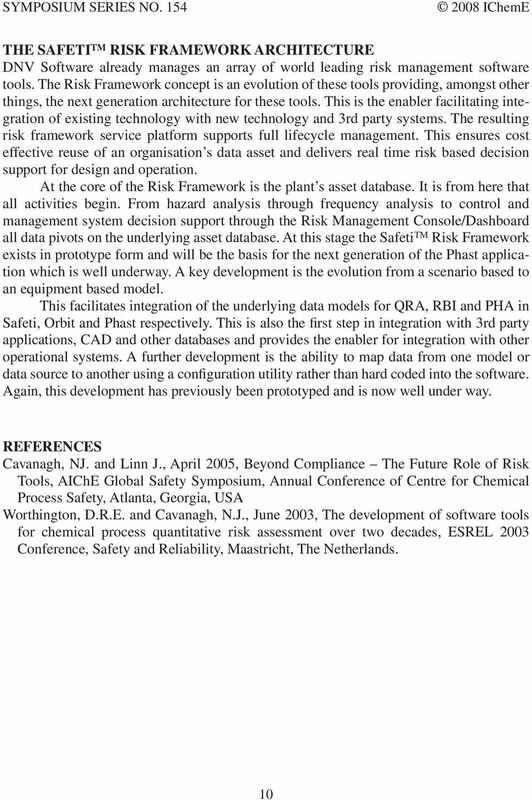 This creates an extra ayer of protection in cases of management system processes faiure. 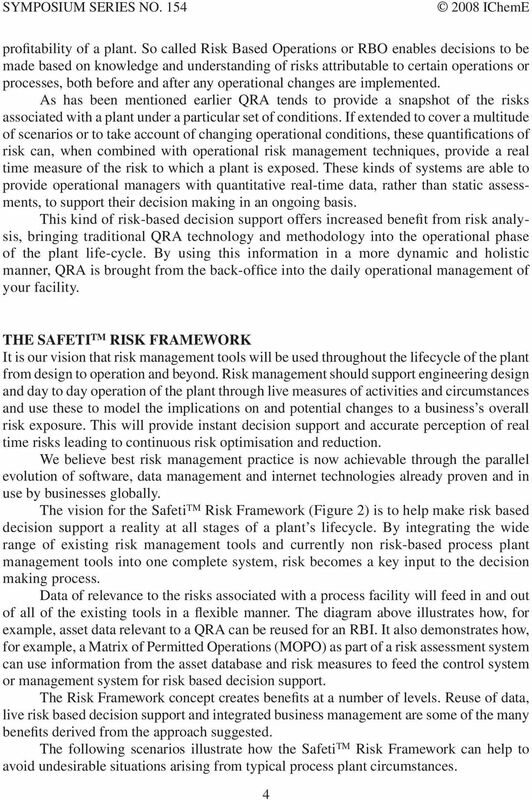 Utimatey the status of each piece of process equipment coud be found by driing down through detais on an enterprise wide risk dashboard. Scenario 2: Due to increased production and simutaneous construction and engineering projects, more staff are required on my site. Can I temporariy ocate them at this ocation? 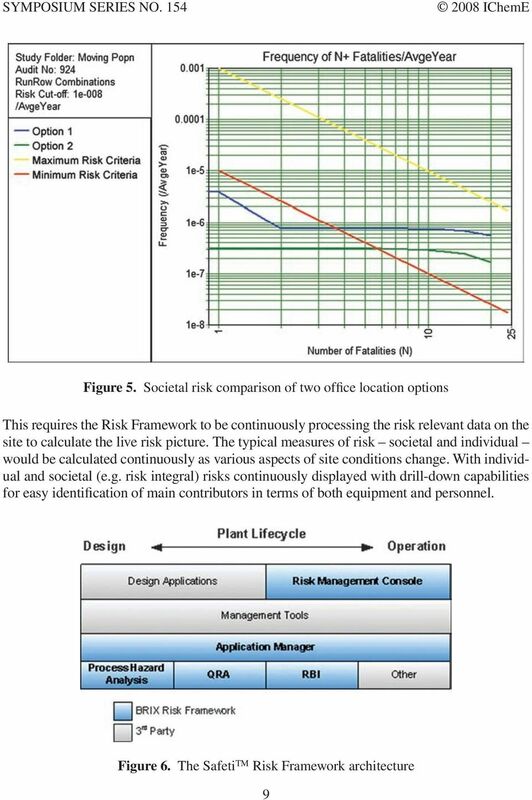 The spatia ayout of popuation can change the risk picture of a process faciity. 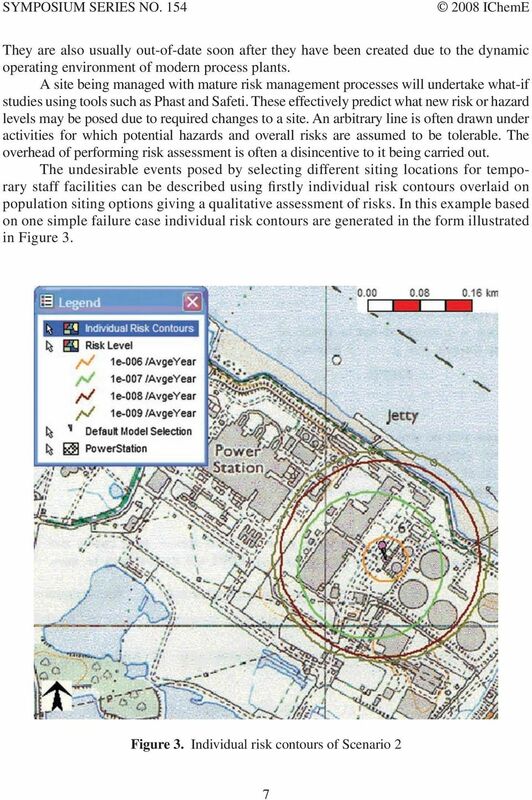 Locating temporary buidings, for exampe, can become a critica part of a faciity s risk exposure. 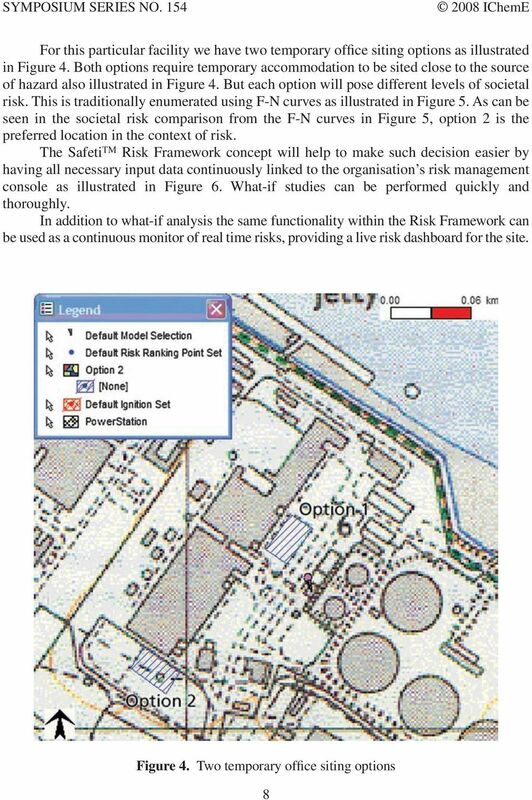 This is the type of decision where risk based support can be critica in the safe operation of a site. 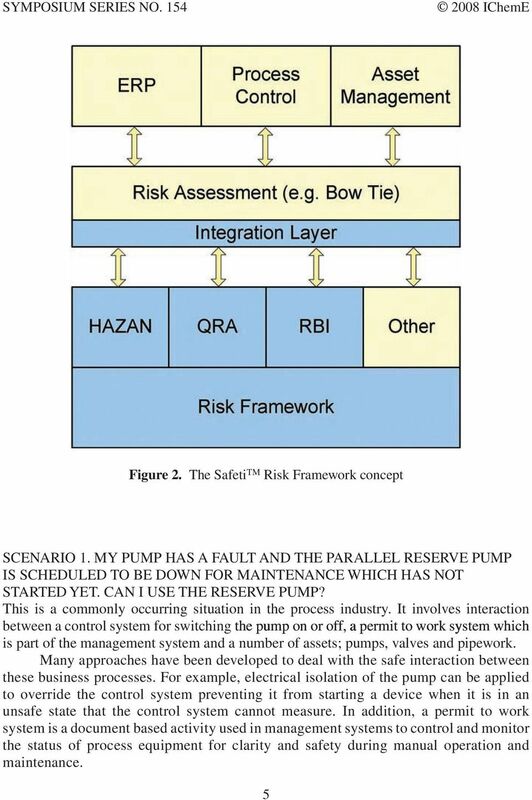 It is often the case that the offine, periodic reports created to compy with some European countries oca impementation of the EU Seveso Directive or the consequence based US Risk Management Programme (RMP) form the foundation for the overa risk management of a process pant. These reports are therefore usuay offine taking ideaised standard operating conditions or hypothetica non-idea operating conditions.